Belgium is known for 3 things, chocolate, moules and frites – oh wait and the beer! I have had mussels and fries at a few Belgian pubs and they have always been good. In fact the best mussels I have ever had were in a Belgian pub in New Zealand, and considering my roots near the ocean I don’t award that compliment lightly. While I only had 16 hours overnight in Brussels, not long enough to spend much time in the city or take a day trip from Brussels. Fortunately there are many affordable Brussels hotels to make a layover simple.. But I was determined to try the mussels and fries in Brussels and asked for a recommendation when I checked in. Armed with a map I made my way through the grimy streets of Brussels (seriously it’s a bit of an ugly duckling) and found myself in what seemed to be the Koh San Road of moules and frites. Although I was a bit apprehensive to eat in a tourist district it was getting late so I sat down to Chez Leon for the 13.90 Euro deal of 500g mussels, fries, a Belgian beer and crusty bread. It could possibly be the worst I have ever had. The mussel shells were not cleaned well so when cooked the grit seeped into the shell. They seemed to be cooked in celery, onion, parsley and tarragon but were flavourless. So bad I deleted the photo of the food! I’m sorry I can’t give you a recommendation for food in Belgium but I can tell you to steer clear of Chez Leon. Next time I’m hitting the Chowhound boards to find a real recommendation. Chance and I had mussels last night at a great little Italian place near my apartment. We had high expectations b/c the pastas are actually awesome there. But we won’t be having seafood there again. First rule of a traveller: Never (ever) eat in a tourist restaurant. We recently travelled through a region famous for seafood, and our 9 year old daughter was so excited to go looking for oysters. We were really surprized she wanted to find oysters … until we realised that she was hoping to find pearls, not eating them. Ugh– that’s the worst! Bad meals can totally taint how I feel about a place. Oh no that is horrible news! I’m obsessed with moules and frites. Boo!!! So sad! Mussels are delicious, what a waste to prepare them so poorly. When did you go? The general rule of thumb I’ve heard in France is to only eat mussels in months with an “r” in them–so basically, not in June, July or August! Such a shame that you were disappointed–I’ve had excellent moules in the winter in Monaco and Nice, but I think my absolute favorite might be a Spanish seafood restaurant around the corner from me in St Kilda, Australia! You forgot vlaamse frites! An absolute must with plenty of mayonnaise and a paper cone. I have to say that I was somewhat disappointed with the mussels in Belgium as well. Sad when they claim to be their specialty. Doh! Hate when that happens. Funny how it was so bad that you deleted the photo! You said it… tourist district. Only tourists go to eat at Rue des Bouchers, so the restaurants know that most of their customers aren’t coming back anyway. So why bother making decent food? If you’re ever coming back, try the mussels at Le Pré Salé or Le Zinneke. And, as a Belgian I can also give you the following advice: never ever eat mussels in a restaurant for 14€, while normal price is 21€. It is super annoying to get caught in a tourist trap restaurant, but it happens to the best of us – especially when you are short on time and super hungry. It’s okay when you end up there by accident or desperation but not by recommendation! Oh no. 🙁 Sorry about the disappointment, hun. Maybe better luck next time you’re passing/travelling through. I had no idea there were more Michelin restaurants, it does make Belgium seem much more attractive. Sorry to read that you have a bad mussels experience in Belgium (by the way, we’re also known for our waffles:-))! 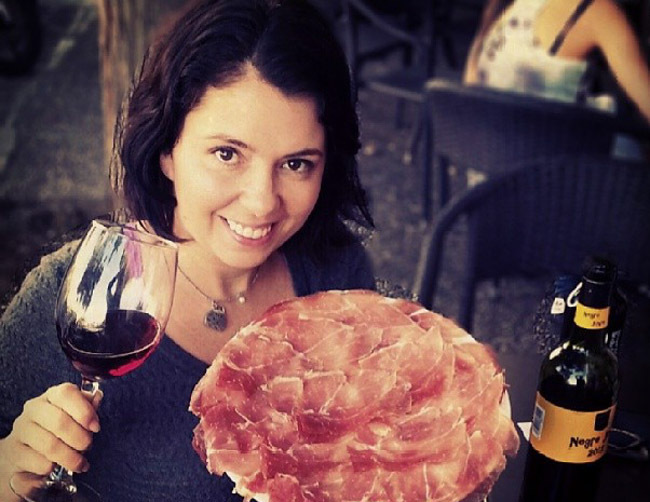 IS known for good food in general, not only for the things you summed up. We have a lot of Michelin restaurants and a lot of good brasseries as well. As a matter of fact, that’s something I always miss when going abroad: our brasseries. They’re something between a regular bar or café and a restaurant: you can get decent dishes the whole day through for a usually reasonable price, without having to feel fancy like in a restaurant. But back to the mussels! Liz, I’m sorry to correct you, but mussels should be eaten in months with an ‘r’, as Christine said. So starting from September. 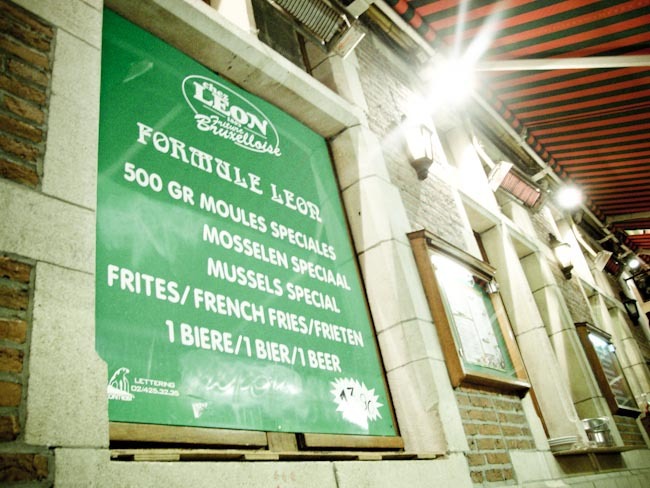 One other thing: Chez Léon de Bruxelles used to be just one restaurant in Bruxelles where you could get a variety of meals with mussels. When it got succesful, the owner decided to expand and opened several Chez Léons across the world. I’ve only discovered this recently myself, when I had dinner at a Chez Léon in London (it was good, by the way:-)). I guess you’ll just have to come back some other time to erase this bad meal memory! IF you ever go again, go to Antwerp. Way better than Brussels! (only thing good in Brussels is Delirium, a great bar with +/- 3162 different kinds of beers). And try the fries, really. They are absolutely delicious. That’s a shame! We’ve had a whole load of amazing food in Belgium. Just as valid to post negative reviews though. Cheers! Oh 🙁 what a pity! You should go to the tourist restaurants. We Belgians never go there! Next time try Le Zinneke or La Marée in Brussels. An even better option is Restaurant Vital near Louvain or almost anything in the wonderful center of Louvain. Louvain is a cosy university town only 15km from Brussels. You should NOT go I meant! !